Dropbox Smart Sync uses lightweight integrations with the Windows and macOS operating systems to function. These integrations are called minifilter drivers (on Windows) and system extensions (on macOS), and they allow Dropbox to automatically download your files as soon as you open them. These integrations work much like the drivers you install to use a printer, copier, or external mouse. In this case, these integrations allow the Dropbox Smart Sync feature to work. You won’t see either the system extension or driver unless you use Dropbox Smart Sync. Why do I see a System Extension Blocked message when I install Dropbox? How do the system extension and driver work? On macOS 10.13 (High Sierra), you may see a System Extension Blocked prompt when trying to run the Dropbox desktop application for the first time. If you don’t allow access for the system extension, you won’t be able to use Smart Sync. In the Enable Smart Sync box, click Continue. In the System Extension Blocked box, click OK. In the Allow Dropbox in Preferences box, click Open Preferences. 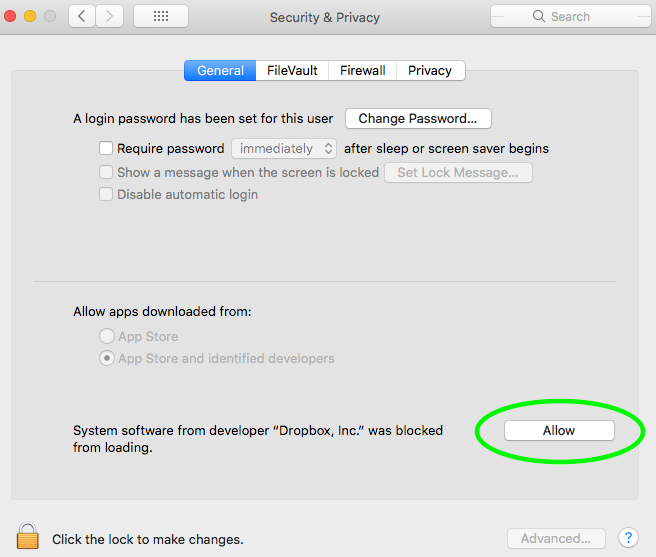 Under the General settings in Security & Privacy, click Allow. What happens if I don't allow access? If you don’t allow access for the system extension or driver, you won't be able to use Dropbox Smart Sync. However, the main Dropbox desktop application will still work like normal. Dropbox used publicly-available APIs from Apple and Microsoft to write the system extension and driver. No additional admin permissions are required (beyond what Dropbox has always needed to function). What does the Dropbox system extension actually do? System extensions enable "callbacks." Callbacks are real-time calls that confirm you have permission to do things like move, delete, or change ownership of files in shared spaces (like a folder). If you don’t have these file access permissions, system extensions allow Dropbox to send warnings when you may be taking an action that could unshare folders or delete shared content. System extensions and drivers can give applications additional access to your computer’s operating system. Dropbox is cautious in only using these extensions to improve your experience with our app. Dropbox takes great measures to protect your data and privacy, and we designed the system extension and driver with security and stability as top priorities. In fact, many of the engineers who wrote this extension previously worked on filesystem technologies at various OS vendors. These components have gone through extensive security reviews with internal security teams, as well as audits done by external penetration testers. We’ve run these components both internally at Dropbox and in cooperation with enterprise-scale beta customers. In both cases these components ran successfully. These integrations are core to current and future Dropbox client services. There is no way to disable or opt-out of using the system extension or minifilter driver on the Dropbox desktop client. Doing so would also disable important alerts that prevent users from accidentally deleting shared data, or taking unintended file actions. If you don’t want to install the Dropbox desktop application, you can view, share, and download your files without the desktop integration by using only the Dropbox website at dropbox.com. Can I choose to not install this extension? Please note that your privacy and security are of the utmost importance to us. Smart Sync and this component have been subjected to rigorous testing and inspection to ensure stability and security. Read more about Dropbox trust and security. Read our detailed technical blog about Smart Sync and the driver. You can opt-out of the system extension or driver if you wish to do so. However, you cannot use Smart Sync without enabling the system extension or driver. If you use Dropbox Professional, or you're a member of a Dropbox Business team, you can opt out of the system extension at any time. However, note that opting out of the system extension will disable Smart Sync. You must have the system extension enabled to use Smart Sync. Click Settings and, if needed, click General. Scroll to Dropbox system extension. Toggle this setting to off. 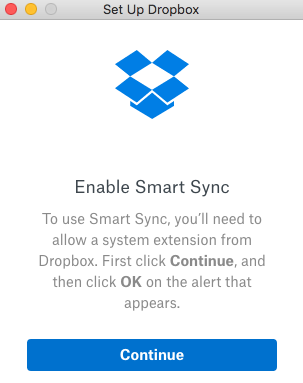 If you're a member of a Dropbox Business team, and your admin disables the system extension, you won't be able to use Smart Sync. This is true on any device where you've signed in to your Business account (even a personal device), and may also affect a personal Dropbox account. If you're the admin of a Dropbox Business team, you can opt out your whole team from the system extension. However, note that opting out of the system extension will disable Smart Sync. You must have the system extension enabled to use Smart Sync. Please also note that some of your team members may have connected a work and personal account. If you opt out your team from the system extension, team members won't be able to use Smart Sync on any personal devices (or personal accounts) where they're also signed in to their Business account. If you'd still like to proceed with opting out your team from the system extension, visit the opt out page to continue.